The Philadelphia Phillies head to Turner Field on Friday, September 22, 2017 to take on the Atlanta Braves. The expected starting pitchers are Ben Lively for the Phillies and Sean Newcomb for the Braves. The odds for this matchup have Philadelphia at +115 and Atlanta at -125. 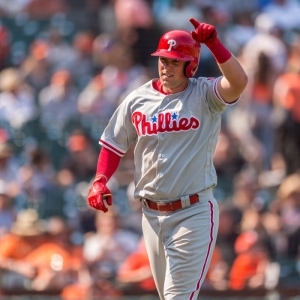 The Phillies have a 68-71-13 over/under mark and a 84-68-0 run line record. The Braves are 76-74-0 against the run line and have a 77-68-5 over/under record. The Phillies have a 61-91 overall record this season. Starting pitcher Ben Lively has a 3-6 record with an earned run average of 3.94 and a WHIP of 1.26. He has 47 strikeouts over his 77.2 innings pitched and he's given up 76 hits. He allows 8.8 hits per 9 innings and he has a FIP of 4.74. The bullpen has an earned run average of 4.28 and they have given up 507 base hits on the year. Teams are hitting .252 against the bullpen and they've struck out 503 hitters and walked 206 batters. As a team, Philadelphia allows 9.3 hits per nine innings while striking out 8.1 batters per nine innings. They are 21st in the league in team earned run average at 4.64. The Phillies pitchers collectively have given up 1,390 base hits and 697 earned runs. They have allowed 210 home runs this season, ranking them 7th in the league. Philadelphia as a pitching staff has walked 487 batters and struck out 1,223. They have walked 3.2 men per 9 innings while striking out 8.1 per 9. They have a team WHIP of 1.39 and their FIP as a unit is 4.58. As a team Philadelphia is hitting .251, good for 20th in the league. The Phillies hold a .411 team slugging percentage and an on-base percentage of .314, which is good for 27th in baseball. They rank 18th in MLB with 8.6 hits per game. Cesar Hernandez is hitting .288 with an on-base percentage of .359. He has 138 hits this season in 480 at bats with 31 runs batted in. He has a slugging percentage of .413 and an OPS+ of 106. Freddy Galvis is hitting .254 this year and he has an on-base percentage of .306. He has totaled 147 hits and he has driven in 61 men in 579 at bats. His OPS+ is 83 while his slugging percentage is at .385. The Phillies have 1,305 hits, including 272 doubles and 165 home runs. Philadelphia has walked 451 times so far this season and they have struck out 1,324 times as a unit. They have left 1,009 men on base and have a team OPS of .725. They score 4.26 runs per contest and have scored a total of 647 runs this year. Atlanta has a 67-83 overall mark this year. With an earned run average of 4.32, Sean Newcomb has a 3-8 record and a 1.60 WHIP. He has 96 strikeouts over the 89.2 innings he's pitched. He's also given up 92 hits. He allows 9.2 hits per nine innings and his FIP stands at 4.37. The bullpen has an earned run average of 4.68 and they have given up 458 base hits on the year. Teams are hitting .241 against the Braves bullpen. Their relievers have struck out 463 batters and walked 209 opposing hitters. As a team, Atlanta allows 9.1 hits per nine innings while striking out 7.8 batters per nine innings. They are 25th in the league in team earned run average at 4.8. The Braves pitchers as a team have surrendered 1,360 base knocks and 714 earned runs this season. They have given up 183 home runs this year, which ranks 17th in Major League Baseball. Atlanta as a staff has walked 546 hitters and struck out 1,161 batters. They give up a walk 3.7 times per 9 innings while they strike out 7.8 per 9. Their team WHIP is 1.42 while their FIP as a staff is 4.57. As a team, they are batting .263, good for 6th in the league. The Braves hold a .414 team slugging percentage and an on-base percentage of .326, which is good for 16th in baseball. They rank 7th in MLB with 9.1 hits per contest. Ender Inciarte comes into this matchup batting .304 with an OBP of .349. He has 190 hits this year along with 56 RBI in 625 AB's. He maintains a slugging percentage of .406 with an OPS+ of 99. Nick Markakis is hitting .274 this season and he has an OBP of .354. He has collected 151 hits in 551 at bats while driving in 69 runs. He has an OPS+ of 96 and a slugging percentage of .387. The Braves as a team have 1,364 base knocks, including 270 doubles and 155 home runs. Atlanta has walked 436 times this season and they have struck out 1,107 times. They have had 1,038 runners left on base and have an OPS of .740. They have scored 4.58 runs per contest and totaled 687 runs this season.